You’ll have to forgive me for the length of this post (There is some art at the end. ), but, Jan, at The Low Carb Diabetic, made an interesting comment a few days ago. Well, Jan, I have to say it’s not you; there are far more lifestyle choices today, and most of them are more acceptable to society than they were a few years ago. These days, being vegan is trendy, and it helps protect the environment, minimalism is on the increase, ‘off-the-grid’ living is becoming more popular, freeganism is gaining recognition, it's acceptable for men and women to have tattoos, and body piercings/modifications and men are even permitted to wear pink. Okay, so the last one isn’t so much a lifestyle choice, but it helps get my point across. Seriously though, the list of ‘alternative’ lifestyles is endless. I’ve got to admit, I whole-heartedly agree with Ellen’s thoughts. Nowadays, except for smoking, perhaps, these lifestyle choices are considered entirely acceptable to most people. There may be some who still regard these lifestyle choices as objectionable, but, in my experience, people are more open-minded today. But ‘back-in-the-day’ my lifestyle choices, at times, made my life challenging. However, I feel it was my attitude that some folk questioned more than my appearance, my friends, or having the odd beer. I questioned everything and believed nothing until I had thoroughly investigated it for myself. I was unwilling to accept that just because something has always been done a certain way that it was right. As a result, I read hundreds of books, I tried things that I never imagined I could even attempt, I made many good friends, I spent my wage on having a good time and visiting as many places as I could. I gave little thought to the future, and I loved every minute of every day. Recently, I met some of those who considered my lifestyle choices questionable. We exchanged pleasantries, but there was little warmth. Many of these people have done what society would call ‘well for themselves’. One thing I noticed, though, was how worn-out they looked. They have achieved whatever goals they set out to achieve. I respect them for that, and I don’t wish them any ill, but their wilted appearance did get me thinking again. Have they got to where they want to be, only to find out it's not what they expected? Have they arrived at the end of the road and discovered a dead-end? Does life hold no mystery, no passion? Today, I don’t smoke, I don't drink alcohol, and my hair is somewhat shorter. On some occasions, I still wear both my earrings. I’m not wealthy, but I have enough to get by. I have a roof over my head, electric in the meter and food on the table. I have a wife whom I love dearly and who loves me in return, and I have a daughter who is the life and soul of the party no matter where she goes. What more do I need? I also maintain my enthusiasm for life. I read sixty to seventy books per year, and I go on as many trips as possible. I’m continually learning, and willing, to try new things; I've made a commitment to learning one new skill every year. A few years ago, most of you will know, I took up writing and have been published in magazines and on the internet, and after a long lay-off, I have returned to one of my first loves - drawing. To me, life is still an adventure with many roads yet untraveled and many pictures still to be painted. Do I regret my lifestyle choices, my lack of wealth and the things that being ‘normal’ is supposed to bring? Well, I’ll leave you, the reader, to decide. I'm obsessed with mandalas. I can't stop drawing them. Here is some of the work I've completed this week. Hope you like them. Have a great weekend. Thank you, Valerie. Moderation of all things is a good way to live; that way you can enjoy everything without becoming overloaded. I think it's fine to try different lifestyles, provided you aren't doing so just for the sake of following the latest trend. To make anything worthwhile, you have to be committed to it. I do like them. You are a master of mandalas! Thank you, sirkkis, for your kind comment. absolutely brilliant post of insights into society and such. And those mandalas- oh my they really are works of art! Happy to live a quiet life not striving to keep up with the Joneses as they say:) happy PPF! Thank you, Linda. I'm glad you enjoyed my ramblings. I was never one for convention. As you get older you begin to find out what suits you best. No harm in trying different things though. Wonderful mandalas! Stopping smoking was a good choice. Hi, Christine. Yes, stopping smoking was a good choice. We have more information nowadays, which makes it easier to make better choices. Very interesting food for thought, thank you for sharing. I loved your artwork too. Hope you have a lovely PPF and rest of your week! Thank you, BrownPaperBunny, for your kind comment. What wonderously detailed pen and inks! Wow! Hi, Beth. Thank you for your comment. I think the problem we have now John is that there is too much choice, the media throws it all at us fogging up our own identity and brainwashing people into thinking they want or need a piece of it all. I'm grateful for a simple life and as long as I have a paintbrush and pen i'm happy! Your mandala's are fabulous, I'm left wondering now if you create them to switch off or switch on?? Happy PPF & Thanks for this great read. Hi, Tracy. Thank you. I love simplicity. That's why I'm into minimalism. Having less frees up space at home and the head. It makes it easier to create and enjoy life. I've given up on the media. They paint a bleak picture of the world we live in, and with the ad men telling us we need all this 'stuff' to make us 'complete' people life becomes daunting. Gosh John, little did I realise my comment would result in this post. I very much enjoyed reading your thoughts and the points you raise. I also like your mandalas, they are so intricate. My good wishes, and enjoy the remainder of the weekend. Hi, Jan. Thank you for commenting. Your previous comment did get me thinking, in a good way. It's odd how our perception of behaviour changes as time passes. Lifestyle choices once though unacceptable are now mainstream. I'm glad you enjoyed reading my post. life choises? Mostly there are no option. You got a job, you go with it. For other choices I never ask people how I shall live. Thank you, NatureFootStep. I never ask anyone how I should live. Choices are there to made. Best to make your own though, and not let other people decide how you should live your life. Hi, June. Thank you for your kind comment. 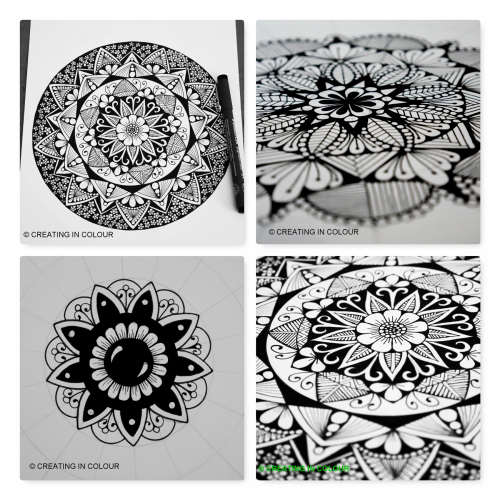 Beautiful mandalas! And I really enjoyed your post. I was never normal, but not in a rebellious way. I'm just different. I didn't feel that, when I was young, but these days lots of people and old friends tell me, that I was always a little different from the other kids. I take that as a compliment. :) Happy PPF! Hi, Kokopelli. Thank you for commenting, and I'm glad you enjoyed my post. I always knew I was different. When all the other kids would be out playing football, I had my head stuck in a book. I wasn't a rebel as such, either. I just preferred doing things differently.